On March 8th, the Westchase District publicly launched its latest mobility study with the aid of more than 20 community leaders. This Westchase Mobility Steering Committee will meet over the next six months to review mobility conditions in Westchase and recommend future improvements. Since the West Houston Association helped found the Westchase District, the District has been a leader in developing mobility improvements in west Houston. The Districts first mobility plan was undertaken in 2001. In 2011, the District’s Pedestrian/Transit Access Master Plan added to the wealth of research and planning that has occurred to keep the Westchase area a highly mobile area. 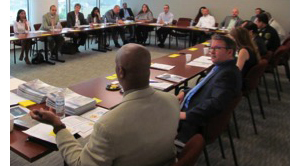 Last December, Westchase District engaged Traffic Engineers Inc. to conduct the latest study. TEI’s project team then conducted research and evaluated existing conditions before asking for input from the West Chase Steering Committee. WHA President Auggie Campbell serves on the Steering Committee with representatives from the City of Houston, Alief ISD, Houston METRO, Houston Police Department, Harris County Toll Road Authority, Ft. Bend County, and the Houston-Galveston Area Council, as well as area employers, property owners and neighborhoods. “Westchase has been very intelligent on how and when it seeks stakeholder engagement,” says Campbell. “The District’s effort to bring industry, residential, and government representatives together at key stages will help maximize support from these groups for a relatively small investment in time and cost.” TEI will use stakeholder input and additional data from focus groups to refine the project goals and develop an interactive web page that will allow for additional community input. The 10-month project will be finalized in October 2016. “The streets are ribbons of real estate that we have to use more efficiently,” observed Amar Mohite from the City of Houston planning department, one of the steering committee members. The study area covers more than just the 2,800 acres of Westchase District. The study is focused on a 3,600 acre area that stretches from Kirkwood to Westerland and from south of Bellaire to north of Buffalo Bayou.